We read year-round, but for your work to be considered for an upcoming issue, please submit no later than the first of the second month of a quarter (February, May, August and November). We typically respond to submissions within a month or two. Please do not send work that has previously been published. Simultaneous submissions are fine; just notify us immediately if a piece is accepted elsewhere. 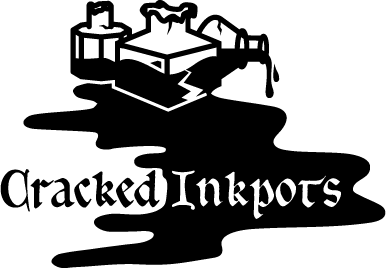 Cracked Inkpots will have first publication rights of your submission. After publication, rights then revert to the author, but we request acknowledgment if a work is re-published elsewhere. Submission cost is $3. Fiction and nonfiction: Send one story/essay at a time. Please keep your word count between 1000 and 2500. Poetry: Send 3-5 poems as a single document, no more than 10 pages total. Photography: Send 3-5 photographs formatted as jpg or png sized between 1000 and 2500 pixels. Send us your narrative or poem based on the Daily Prompt at the top of this web page and we’ll publish our favorite tomorrow. No more than 500 words. All submissions should be typed in the body of your email and sent to dailyprompt@crackedinkpots.com by 6:00pm EST. Only one submission per prompt, please.